Fred sent an email to President Triggs of the Human Rights Commission requesting their office to engage the W.A Ombudsman for legal representation in his current matter before the Appeal Court. If u need a criminal lawyer I have a few names I can swing over to u but they are not cheap….But will win…. Just a heads up… Don’t advertise what Ur after on gumtree….It will come back and bite u on the arse… The less public u make it AT THIS POINT will work in Ur favour further down the track…..Just saying…..
Gee ! i was quite excited of receiving news you passed on my gumtree to a lawyer you said would win my case! I posponed writing to the international organisations and media to expediate Justice anticipating a Lawyer contacting me. It is not just being screwed it’s they intensionaly stole my money, in excess of $60,000. 00 to date. I pay the State Solicitors Office $100.00 a month. I want it back with compounded interest. I don’t care where they get it from, Lawyers John Park and a few others or pass the hat around, They can go to filthy forgers Moncrieff Realty for the money. 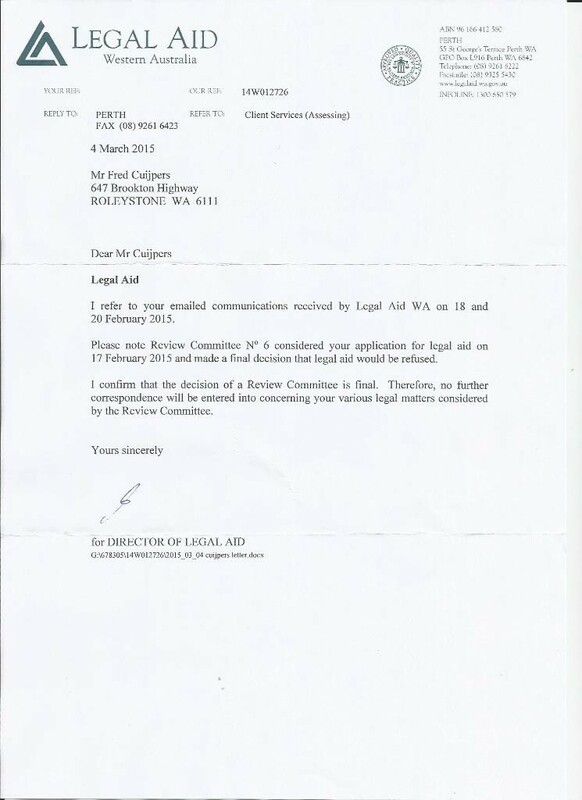 There still remains the simple solution a Lawyer acts properly for me pro bono and the cases are dismissed as an “abomination of the rule of law” I have no interest in going public, My adverts and blog are to receive my entitled legal and human rights as an Australian Citizen. They chose this path not me. If they want me to sign a non disclosure i will at the completion of Justice being done. Cases of this kind are usually sealed by Courts, therefore only vexation on their part is preventing Justice. I do appreciate your concerns for my well being but these cases have isolated me from my family and for that yes! i am angry. Thankyou for taking the time to write. Thanks for seeing my blog. Recently a new review was asked of the Court because i was prevented from attending the final directions hearing before a decision. Lawyers in Australia are still refusing to take my case. A copy of the submission was sent to all Parliament members in W.A. Not having a Legal degree a member was at a loss of what the submission was about.I sent the letter posted here to members of Parliament. I sent you a copy of my letter 11 December 2017 and file emailed to Justice Curthoys from the State Administrative Tribunal. It may difficult to comprehend what it is about so I give a brief explanation. Justice Curthoys should understand it. It means by State administrative Acts he can review a decision if he is an honest and impartial Judge. It also reads to him By section 59 of the SAT ACT it was never required for me to take this to a Court at all. It was for the Legal Profession Complaints Committee to take the fraud part of the transcript you have and exhibit list to the SAT or Supreme Court for a decision I am asking for now from Justice Curthoys. It means the Court should have overturned the result of PE1971/04 on the Question of Law deciding to the Rules of evidence a long time ago as the LPCC letter states 5 June 2009. The Ombudsman, and Attorney Generals have the power to make thing right but refused to date. I propose to you if Justice Curthoys refuses for any reason not to review and make a decision in my favour then there is a cover up in progress going back to February 2006. Believe me when I say I hope I’m mistaken! Ask yourself why is Legal Aid refusing to act for me? It is an open and shut case. I offered to pay. Because it is an open and shut case a costs order would be granted from a Court, so there is no expense incurred by a Legal Aid Lawyer or an outside Lawyer they can appoint. 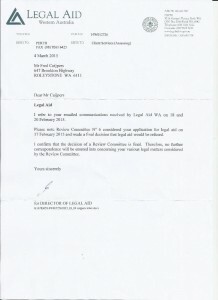 In all the appeal processes I have undertaken not one Judge has said the 16 July 2004 letter was genuine or a forgery. WHY! They skirted around the question. Look at it on my blog with other documents. My complaint to the Legal Profession Complaints Committee was February 2006. They should have instructed Mr Blyth to appeal the cases he was responsible for by allowing this letter into a court. That was all I wanted. No the LPCC had to drag this out for years to deny me Justice while having their snouts in the public purse collecting six figure sums of money abusing their positions. My evidence indicates I was the victim of a stitch up in 2005, the evidence indicates Mr Blyth had a undisclosed conflict of interest i.e Moncrieff Realty who have a relative Simon Moncrieff working as a Barrister at the time. I made allegations of forgery by Moncrieff Realty a letter (16 July 2004) to have my former partner reverse her decision of 4 November 2014 and seek a fresh MRO on me. For those of you who have no legal training as myself I will try and explain what the letter 11December 2017 to the SAT represents. Pages 18,19,20, transcript JK represent having JK lie about receiving the letter. You will see the date of the letter is never mentioned so I do not know it is before the Magistrate. At this stage I have no idea the forgery is being presented to the Court. I had told Mr Blyth in no uncertain terms the letter could only be a forgery when he received it by mail from Moncrieff Realty. I will send you his file note he accidently provided me when I commenced looking at appealing. Mr Scudds at page 20 clearly requested it be marked MFI (marked for identification) Mr Scudds did nothing wrong. Let me make that absolutely clear! I have no complaint of him, He is entitled to stand by and say nothing when a Magistrate abuses their office. He is working for his client not like mine. By making it “H” the Magistrate committed fraud because it is represented in the exhibit list of PE 1971/04 as being a lawfully testified to document, meaning delivered to me and being authentic in content and signature. My Lawyer let it happen in front of him and did nothing. Then from receiving the exhibit list he did not call for a mistrial on 20 May 2005 in final submissions. You can see from my scribble on the transcript pages that I’m trying to understand how and make sense of what happened! How do I approach this! The trial PE1971/04 lead to criminal convictions (PE22143-5/05 by the fraud of the letter being now seen by Courts as a genuine letter when it wasn’t. Don’t get me wrong, there are two victims here , JK and myself. Sadly JK passed away in 2007 from a long term illness. JK was induced to reverse her decision by deceit, fraud and forgery. By fabricating the letter JK thought I lied to here when I said I never got a letter 16 July 2004. Think about it, if you think someone is lying about receiving a letter telling them not to do something that effects you, what might do? If you do anything please read this paragraph on link to get an understanding of deceit, fraud and forgery, then you will understand why and how JK was induced to reverse her decision.